When putting together this list of the 10 all-time greatest NFL coaches, I not only factored in their overall records, but also their influence on the game of pro football. While a coach like Weeb Ewbank or Chuck Knox might have had impressive NFL resumes in their own right, I felt that the coaches listed below had a greater impact on the league. These are the men who either helped found the league, appeared at pivotal times in league history or changed the way the NFL game was played. While Super Bowl wins and appearances also counted for something, they weren�t the most important factor. You won�t see Mike Shanahan on the list, nor will Dan Reeves or Marv Levy be making an appearance. While they all deserve to be in the Hall of Fame one day, their contributions simply aren�t lasting enough to be among the 10 greatest coaches in NFL history. In no particular order, here are the 10 greatest all-time NFL coaches. Don Shula – With a staggering win-loss record of 347-173-6, Shula remains the most winning coach in NFL history. He made six Super Bowl appearances as a head coach and won the league title in 1973 and 1974. He also presided over the Dolphins� 1972 perfect season, the only such season since the AFL/NFL merger. From 1951 until 1957, Shula played defensive back in the NFL. He played in a total of 73 games for the Browns, Colts and Redskins. After serving as a defensive backs coach for the University of Virginia and University of Kentucky, Shula got a job in 1960 as the defensive coordinator for the Detroit Lions. In 1963, at the age of 33, Shula was hired to become the head coach of the Baltimore Colts. During seven seasons with the team, Shula went 71-23-4. Following the 1969 season, Shula was hired to be the second head coach of the Dolphins. With players such as Larry Csonka, Jim Kiick and the �No-Name Defense,� the Dolphins won two Super Bowls under Shula in a very short period of time. Unfortunately, Shula would never win another championship after 1974, despite the addition of quarterback Dan Marino. Shula coached in 33 consecutive seasons and holds the record for the most games coached in the NFL (526). He�s tied for the most Super Bowl losses with four, but also has two wins to his credit. Vince Lombardi – The son of Italian immigrants, Vince Lombardi would grow up to become one of the most iconic figures of the National Football League. With a lifetime record of 105-35-6, Lombardi would capture five league championships while coaching the Green Bay Packers. His coaching career started at a Catholic high school in New Jersey, and he would later accept an assistant�s job at West Point. At the age of 41, he moved on to become the offensive coordinator with the New York Giants (alongside defensive coordinator Tom Landry) and helped turn the less-than-successful team into league champions. In 1959, he was named Head Coach and General Manager of the Green Bay Packers. In his second year there, the Packers reached the NFL championship game but fell short. 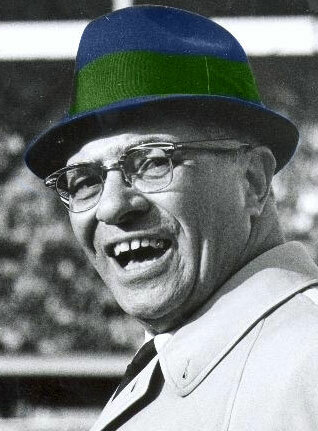 Lombardi vowed that it would never happen again, and he kept his word by winning his next nine post-season games. Never having a losing season, Lombardi won three consecutive NFL championships and the first two Super Bowls (including the infamous Ice Bowl). He implemented the dreaded �Lombardi Sweep,� and later helped revitalize a lackluster Washington Redskins franchise. His dedication to winning was unmatched, and many of his motivational phrases are commonly used to this day. Lombardi died in 1970 from intestinal cancer at only 57 years of age. A week later, the league renamed their Super Bowl trophy after him. 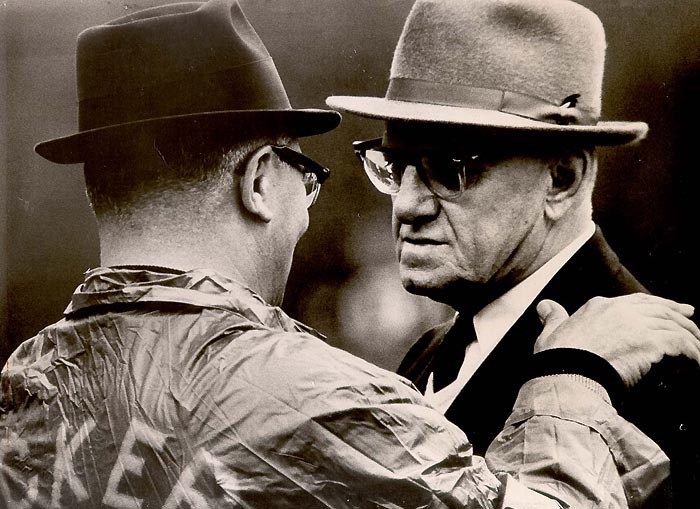 George Halas – Known as �Mr. Everything� and �Papa Bear,� George Halas racked up a career record in the NFL of 324-152-32. He coached the Decatur Staleys, Chicago Staleys and Chicago Bears for an incredible 40 years, only suffering through six losing seasons during that time. After serving in World War I, Halas played baseball for the New York Yankees. A hip injury ended his pro career, but he would later play semi-pro baseball and football for the A.E. Staley Company while serving as a representative for Illinois-based starch manufacturer. In 1920, the Staley family became involved in the American Professional Football Association (later the NFL), and Halas acted as their representative. Halas was later given control of the team, and he moved them to Chicago, adopting the Bears name in 1922. Halas played wide receiver and defensive end for the team, as well as serving as head coach. After retiring from the game and becoming sole owner, he returned as their coach in 1933. In the late 30s, Halas helped to create the T-Formation, one of the most utilized formations in modern pro football. After serving in World War II, Halas returned to coaching the Bears. Before retiring in 1967, Halas had captured league titles in 1921, 1933, 1940, 1941, 1946 and 1963. He continued to serve as the team�s owner until his death in 1983, and, appropriately enough, the NFL Hall of Fame is located on George Halas Drive. 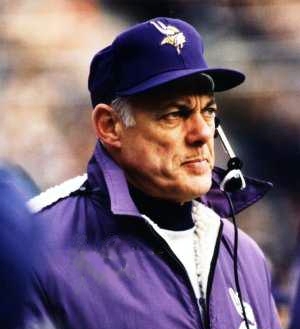 Bud Grant – Besides coaching the Minnesota Vikings for 18 season, Grant also spent a decade coaching the Winnipeg Blue Bombers of the Canadian Football League. His career record in the NFL was an impressive 168-108-5, and he was voted the NFL�s Coach of the Year in 1969. Prior to coaching, Grant has a career as a professional athlete. He played as a reserve for the NBA�s Minneapolis Lakers, then moved to Philadelphia and played wide receiver and defensive end for the Eagles. Following that, he moved to Canada and served as an offensive end for the Winnipeg Blue Bombers. 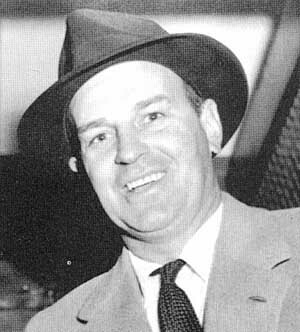 In 1956, Grant became the head coach of the Blue Bombers. During his decade with the team, he led them to six Grey Cup appearances, winning the championship four times. Named CFL Coach of the Year in 1965, he finished his CFL coaching career with a record of 122-66-3. In 1967, he was hired to be the new head coach of the fledgling Vikings. Grant would become the first NFL coach to lead his team to four Super Bowls, although the team lost each one. He retired from the NFL as the eighth most winning coach in history. As of this writing, Grant still keeps an office at Vikings� headquarters and serves as a consultant for the team. Tom Landry – Famous for his calm demeanor and trademark fedora, Landry is considered one of the most innovative minds in the history of the NFL. Under his watch, the Dallas Cowboys became known as �America�s Team� and enjoyed 20 straight winning seasons. After serving as a bomber co-pilot in World War II, Landry returned home and played fullback and defensive back for the University of Texas. He would later play as a defensive back in the NFL and serve as a player-assistant coach for the Giants in his last two years. Upon retirement, he became the defensive coordinator for the Giants, inventing the 4-3 Defense along the way. During his time there, the Giants made it to three NFL championships in four years. In 1960, he became the first head coach of the Dallas Cowboys and coached there for 29 seasons. From 1966 to 1985, the Cowboys enjoyed 20 straight winning seasons. Supported by quarterbacks such as Roger Staubach, Don Meredith and Danny White, Landry compiled a career record of 270-178-6. The Cowboys reached five Super Bowls with Landry and won in 1971 and 1977. In 1990, less than two years after his final game, Landry was inducted into the Pro Football Hall of Fame. In 2000, at the age of 75, Landry passed away from leukemia. Although he is gone, his legacy continues to loom large over the Cowboys and the entire NFL. Joe Gibbs – The 20th and 26th coach of the Washington Redskins, Gibbs is a Hall of Fame coach and a successful NASCAR owner. During his first 12 seasons with the Redskins, Gibbs led them to eight playoff appearances and three Super Bowl titles. His career record stands at 171-101 with only three losing seasons. In college, Gibbs played linebacker, tight end and offensive guard. After obtaining his master�s degree, he took a job as the offensive line coach under offensive innovator Don Coryell. He would later work for Florida State, Southern California and Arkansas. In 1973, he was hired as the running backs coach for the St. Louis Cardinals (by Don Coryell). He then moved onto the offensive coordinator for the Tampa Bay Buccaneers before joining Coryell with the San Diego Chargers. During his two seasons in San Diego, Gibbs and quarterback Dan Fouts led the potent �Air Coryell� passing attack, becoming the first team to average more than 400 yards of offense per game. In 1981, after 17 years as an assistant, Gibbs was offered the head coaching job for the Redskins. Despite an 8-8 debut season, the Redskins rebounded in 1982 and won Super Bowl XVII. They reached the championship game again in 1983, but were defeated by the L.A. Raiders. In 1987, the Redskins defeated the Broncos 42-10 to win Super Bowl XXII. In 1991, Gibbs won his third Super Bowl by defeating the Buffalo Bills 37-24. Gibbs retired suddenly in 1993, and he was elected to the NFL Hall of Fame in 1996. He is still the only coach to win three Super Bowls with three different quarterbacks and three different halfbacks. Gibbs returned to coaching in 2004, finally lured back by Redskins owner Daniel Snyder. During four seasons, he led his team to the playoffs twice, finally retiring after the 2007 season. One of the game�s most innovative coaches, Gibbs created the single back, double and triple tight end set. He also created the Trips Formation, in which three wide receivers lined up on one side of the field. His offenses were also known for their shifting and motion, and this allowed players like Art Monk, Gary Clark and John Riggins to be very successful. Bill Walsh – With a record of 102-63-1, Bill Walsh is considered perhaps the greatest offensive mind to ever coach in the NFL. He popularized the West Coast Offense, and many modern-day NFL coaches got their start under Walsh or one of his assistants. Before being hired as the head coach of the 49ers, Walsh served as an assistant with the Oakland Raiders, Cincinnati Bengals and San Diego Chargers. He also coached the Stanford Cardinals before and after his stint with the Niners. Walsh might have been an NFL head coach earlier, but some stories suggest Walsh mentor and then-Bengals coach Paul Brown impeded Walsh’s rise in the NFL ranks. Whatever the case, Brown and Walsh are credited with founding the West Coast Offense while coaching together in Cincinnati. His career with the Niners got off to a rocky start, but luckily he drafted Joe Montana in the third round of the 1979 draft. As he perfected the West Coast Offense, players like Montana, Jerry Rice, Ronnie Lott and Charles Haley helped lead the Niners to three Super Bowl titles (XVI, XIX and XXIII). With numerous Coach of the Year honors, Walsh was also instrumental in the hiring and development of many modern NFL coaches. This list includes Mike Holmgren, George Seifert, Ray Rhodes, Mike Shanahan and Dennis Green. Chuck Noll – With more Super Bowl wins than any other coach in NFL history (4), Chuck Noll was elected to the Hall of Fame in 1993. He coached the Pittsburgh Steelers from 1969 until 1991 and compiled a career record of 209-156-1. After playing guard and linebacker for the Cleveland Browns, Noll worked as an assistant coach for the Chargers and Colts. In 1968, when Noll was the defensive coordinator for the Colts, they set an NFL record for fewest points allowed in a season. Later, he was hired to lead the Steelers prior to the start of the 1969 season. Noll�s Steel Curtain Defense was overwhelming, and he was particularly skilled at selecting players in the NFL draft. In 1974, Noll selected four future Hall of Famers with his first five picks (Lynn Swann, John Stallworth, Jack Lambert and Mike Webster). No other team has ever drafted more than two Hall of Famers in a single draft. His 70�s teams were incredibly dominant, featuring players such as Terry Bradshaw, Joe Greene, Jack Ham, Franco Harris and Rocky Bleier. Despite his talent as a coach, Noll would not receive Coach of the Year honors until 1989. Bill Belichick – Twice named Coach of the Year, Belichick is the only name on this list to still be coaching in the NFL. With a current career record of 142-85 (prior to the 2008 season), he has led the New England Patriots to Super Bowl wins in 2001, 2003 and 2004. In 2007, his team went undefeated during the regular season and narrowly lost the Super Bowl to the New York Giants. After playing football, squash and lacrosse in college, Belichick graduated with a degree in economics in 1975. Upon graduation, he accepted an assistant�s position with the Baltimore Colts and would spend the next 15 seasons as an assistant with the Colts, Lions, Broncos and Giants. 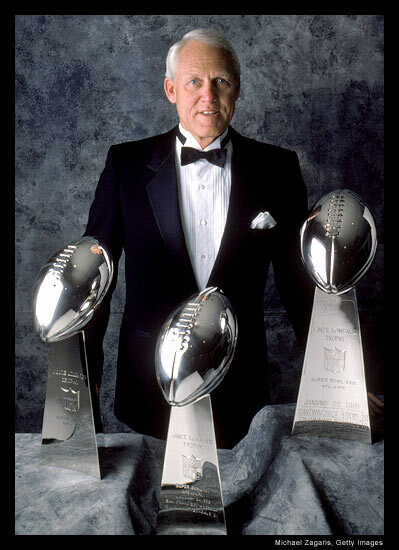 During his time with the Giants and coach Bill Parcells, the team would win two Super Bowls. From 1991 until 1995, he coached the Cleveland Browns, but he only compiled a record of 36-44. He was reunited with Parcells in New England for the 1996 season. He then followed Parcells to the New York Jets, and was later named as their head coach in 1999. At a press conference to announce the hiring, Belichick surprised the media by announcing his resignation from the team. Shortly thereafter, he accepted the head coaching position with the Patriots, although the team ultimately had to pay the Jets a first round draft pick to secure his services. In his second season with the team, the Patriots won their first Super Bowl in franchise history. While they missed the playoffs in 2002, the team repeated as champions in 2003 and 2004. In 2007, following the Spygate controversy, the team won every game during the regular season and once again advanced to the Super Bowl. If not for a miracle catch by the Giants, Belichick would have tied Chuck Noll for the most Super Bowl wins by a NFL head coach. Paul Brown – Considered by many to be the father of the modern football offense, Paul Brown was successful as a football coach on the high school, college and professional level. With a professional record of 170-108-6, Brown�s teams won seven league championships, including the NFL and AAFC. After coaching on the high school level, Brown moved on to head the program of the Ohio State Buckeyes. The team won their first national championship under Brown, and he finished his career at the school with a record of 18-8-1. Following World War II, Brown left Ohio State and became the coach, co-owner, vice president and general manager of the Cleveland Browns of the All-American Football Conference. Despite rumors to the contrary, the team was not named after Brown. Instead, they were originally called the Brown Bombers, after heavyweight champ Joe Louis, but this was shortened to the Browns. The AAFC folded after four seasons, but the Browns won the league title each year. The team then moved into the National Football League, and Brown ignored the tradition of not drafting African-American players into the league. He added such stars as Marion Motley and Bill Willis, and the Browns won three NFL championships in the 1950s. Brown would later coach the Cincinnati Bengals from 1967 until 1976, leading the team to three playoff appearances. Afterwards, he would stay on as team president, and the Bengals would make two Super Bowl appearances in the 80s (losing both to the Niners). Brown was the first coach to give his players an intelligence test, put together a game film library, put facemasks on helmets, communicate via radio transmitter to players on the field and teach players in a classroom setting. One of his understudies was Bill Walsh, but Sam Wyche, Bill Johnson, Sid Gillman, Blanton Collier and Weeb Ewbank also learned from the NFL great.